Whitley Bay manager Andy Gowens and his assistant Mick Mulhern will be holding a Talk-in after the friendly at home to Sunderland U23s on Saturday, 21st July. The event will include a question and answer session to discuss the team and plans for the coming season. All fans are invited to attend the event which will take place in the clubhouse. After victories in the opening two friendlies, Whitley were beaten 6-3 by newly promoted Morpeth Town in an entertaining game at Hillheads. A powerful Morpeth side scored four times in 14 first half minutes, including an own goal and a penalty. Whitley pulled one back through another own goal but Morpeth made it 5-1 soon after. The second half saw a determined Whitley battle back strongly and they scored twice in ten minutes, through Jack Foalle and a header from one of five triallists. Morpeth added a sixth goal but Whitley might have made the final score much closer with a series of opportunities that they created but they were denied by some excellent Morpeth goalkeeping. Experienced striker Stephen Ramsey who made over 300 appearances scoring more than 80 goals for South Shields, is the latest signing as Whitley prepare for the new season. Ramsey was a member of the Mariners’ squad that won the treble of FA Vase, Northern League championship and League Cup in 2016/17 but suffered a broken leg in March 2017 and as a result missed out on a possible appearance at Wembley. Playing as a triallist, he scored twice in the 7-2 win at Bedlington Terriers and put pen to paper shortly after the final whistle. 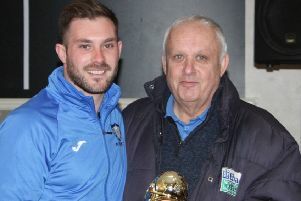 Mariners’ Joint Manager Lee Picton, who was a FA Vase winner in his days at Hillheads said: “Stephen has been an incredible servant to the club during his time here, and an absolute pleasure to be around. “Myself, Graham and I’m sure everyone at the club would like to thank Stephen for his commitment and efforts. Also signing on the dotted line after the Bedlington game was 19 year old Chris Allan, a left sided midfielder who has spent the last two years on contract at Sunderland AFC Academy. Allan played in the second half of the Bedlington game.